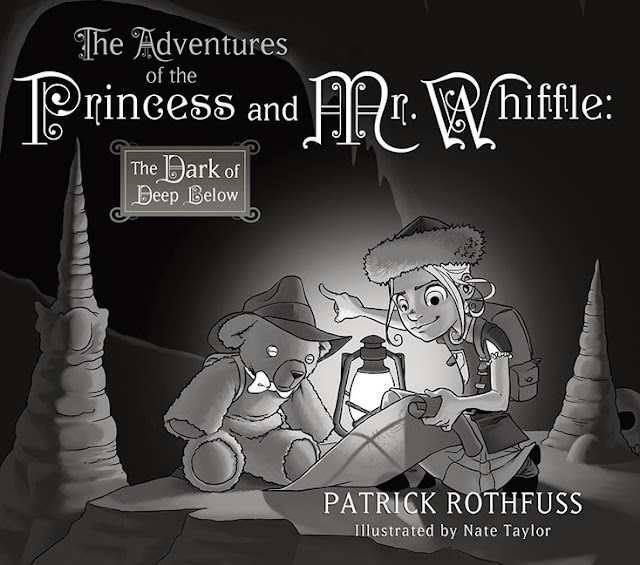 It's been over three years since Subterranean Press released Patrick Rothfuss' The Adventures of the Princess and Mr. Whiffle: The Thing Beneath the Bed. This "not a book for children" turned out to be an interesting read, albeit a short one. It was obvious that we had not seen the last of the Princess and Mr. Whiffle, so I was pleasantly surprised when an ARC of this second installment showed up in my mailbox. The Adventures of the Princess and Mr. Whiffle: The Dark of Deep Below is once again illustrated by the talented by Nate Taylor. And weighing in at 159 pages, this time around I feel that you really get your money's worth. With Patrick Rothfuss' twisted sense of humor, I was curious to see where the author would take his tale next. We're pleased to announce the second volume in The Adventures of the Princess and Mr. Whifffle. This time around, Patrick Rothfuss and Nate Taylor have dreamed up an adventure that's nearly twice as long as the original. In in first volume of The Adventures of The Princess and Mr. Whiffle, we learned what lurks beneath our beds. What's more, we learned that little girls are not helpless, and that princess are not always what they seem. And we learn what happens when the Princess gets a little brother. The Adventures of The Princess and Mr. Whiffle: The Dark of Deep Below is a dark twist on the classic children's picture book. Visually, once again I must admit that Nate Taylor did a wonderful job. The art features all the trappings of a normal children's work. Humorous and cute in the foreground, yet a closer inspection reveals certain details that have nothing to do with children's books. And I'm sure that a reread would reveal a number of details I've missed the first time around. Once more, Taylor managed to give shape to Rothfuss' narrative perfectly, creating a beautiful imagery in the process. And the artist did elevate his game, for the illustrations in this second volume are even better than those featured in its predecessor. There is more blood, gore, and violence in this one, and the narrative accompanying such sequences is for the most part witty and hilarious. It was interesting how Rothfuss incorporated the themes of love/hate/rivalry between siblings and made them the heart of the tale. Don't get me wrong. The Adventures of the Princess and Mr. Whiffle: The Dark of Deep Below remains a light read. And yet, there is more depth to the story than could be found in the first installment. The better part of the book is told from the Princess' POV. But her little brother Gubby gets his own point of view near the end, which was nice. And of course, the ever silent and stalwart Mr. Whiffle is always there. I really want to read this book, Patrick Rothfuss is one of my favorite fantasy authors right now. Nice review.